Gasp! The Washington Post headlines an Obama mistake! Of course it was the Saturday edition -- The Washington Post's Siberia. But that the editor okayed a discussion of doubts for the front page -- I repeat, above the fold -- might indicate the shortest honeymoon period ever for a U.S. president. The revised GDP figure helped stoke skepticism among economists who say the White House's projections for the nation's recovery are too rosy. Based on those projections, Obama said he would slash the deficit in half by the end of his term. In its budget outline, the administration predicted that the economy would shrink 1.2 percent this year and grow 3.2 percent next year. By contrast, the consensus among private forecasters is that the economy will shrink 1.9 percent this year and grow 2.1 percent next year. "It's just premature to expect the economy to be recovering," said Joshua Shapiro, chief economist at MFR, a forecasting firm. He said he expects the recession to drag into early next year. "If you looked at the Obama administration's forecast, it's very much at the optimistic end of the spectrum. There's a whole 180 degrees between us and them," Shapiro said. "That doesn't guarantee they're wrong and the pessimists are right. But they are making pretty optimistic assumptions right now to hit even these terrible numbers for deficits." Christina Romer, chairman of the White House Council of Economic Advisers, told reporters yesterday that the administration's growth projections were made weeks ago, before data showed an even deeper recession, and noted that it is normal for an economy to bounce back fairly sharply after a major downturn. I hate to be the bearer of bad news, Ms Romer, but there is nothing normal about this recession. Economists are famously myopic about predicting recessions and their duration but the situation this time is so extraordinary that most economists are sensibly practicing caution in their predictions. Not so for Mr Obama's economic advisors, who committed him to a projection and stimulus strategy that do not fully take reality into account. Were the advisors pushed to wear rose-tinted glasses so that Mr Obama's first speech to Congress could be 'sensitive' to complaints from the media that his earlier announcements about the economy sounded apocalyptic? I hope not, although that would be consistent with the political-campaigning style he's carried into the White House. Whether their outlook is bleak or hopeful, analysts agree on one thing: The most serious threat to the economy is the credit crisis. Until banks are healthy enough to begin lending more, the economy is not likely to see sustainable growth, even with the massive stimulus package approved this month by Congress. "Until you get the banking sector going, all the stimulus can do is provide a brief reprieve," said Bernard Baumohl, chief global economist at the Economic Outlook Group, a forecasting firm in Princeton, N.J. "Otherwise we could be condemned to a period of anemic growth or slip back in to recession in 2010 once the stimulus dissipates." Yet it's beginning to look as if President Obama sees his agenda for "spreading the wealth around," as he's put it, as having equal importance with battling the credit crisis. Er, is President Obama proposing geriatricide as a means to reduce America's budget deficit? Mr. Obama would try to lift the incomes of the middle class and poor through two main channels, administration officials said. The first is an overhaul of health care, meant to reduce the insurance premiums now taking a large bite out of many families’ paychecks. The details remain vague, but the budget begins paying for investments that would eventually allow Medicare officials to refuse to pay for medical treatment that does not show evidence of improving health. If successful, that change would vastly reduce the government’s long-term budget deficit. It is also likely to bring down private health costs, since insurers typically follow Medicare’s lead. Small wonder the details are vague; many of the medical conditions that beset the elderly, including aging, do not improve with medical treatment. The best that can be hoped for is management of symptoms for a host of illnesses, such as Alzheimer's and COPD, which are typically associated with aging. Of course the same holds true for many illnesses that not are age-specific, such as AIDS and asthma, and which can only be managed, not improved. I have a hunch that the AARP would have something to say about a backdoor proposal to slip geriatricide policy into Medicare reform. Granted, the Social Security problem is now at crisis proportions as the post-WW2 generation approaches retirement. But any solution that encourages involuntary manslaughter of the elderly is out of bounds in a civilized society. I would remind President Obama that America's medicine fields have grown into mega-industries because of research and treatment methods aimed at helping people manage incurable illnesses and the wages of aging. I also remind House Speaker Nancy Pelosi that allowing elderly people who cannot afford private insurance to die from medical neglect is not a humane way for a government to reduce humanity's carbon footprint. There is a simple means to bring down Medicare costs and that's to omit Medicare fraud. For reasons I don't understand our government has made only the most cursory attempt at stopping the massive fraud. For those who are worried about the $1.75 trillion deficit that President Barack Obama projected the government would run in fiscal 2009, wait until you see what the interest on the growing U.S. debt will be. The U.S. debt is roughly $10.6 trillion and the government spent $253 billion servicing it last year. With the mounting yearly deficits, that cost is skyrocketing. During the debate over the $787 billion economic stimulus plan aimed at pulling the U.S. economy out of its downward spiral, Republicans argued that the cost was really over $1.1 trillion because of the cost to service the additional debt. Lest folks think that current low borrowing costs would make the burden a little lighter, Obama’s fiscal 2010 budget projected that during his upcoming four years in office the cost will run roughly $1 trillion. My greatest concern at this time is that the leaders in the European Union are trying to rush the Obama administration into making far-reaching decisions. My second greatest concern is that Mr Obama is rushing because he doesn't want to be unpopular. I have noticed that President Obama has a tendency to confuse the world with high school. The EU is going to have a lot of fun with his view of the world if he doesn't wise up fast. The goal for the U.S. President is not popularity. The goal is to act in the best interests of the United States, which is the economic engine of the world. No amount of U.S. popularity will save the world if the U.S. falls. But since the rise of the EU, every time a U.S. administration doesn't do exactly what the EU leaders want, suddenly all over Western Europe half the population turns into streets and shouts Down with the USA. And the BBC is always on the spot to record the protests for the evening's broadcast, which is global. Then -- and this is the part I love -- they send armies of Talking Heads to appear on U.S. TV shows, to explain to Americans what steps we can take to stem the tide of anti-Americanism sweeping the world. Get used to it, Mr President. A wag observed recently that the economic crisis is "Obama's Iraq." I think the better comparison is the immediate aftermath of 9/11. So much is happening so fast in this war on the global economic meltdown, and on so many fronts, it harks to the storm of government activities here and abroad that arose in the wake of al Qaeda's attack on America. The comparison falls apart, however, if you consider that the Bush administration was well-settled in place when the attack occurred, whereas Barack Obama moved into the White House in the midst of the financial meltdown. So I am not happy that the EU -- poked and prodded by our dear allies, the 'Big Three,' Germany, France, and UK -- has chosen the April 2nd Group of 20 summit as the drop-dead date for the United States to have in place a plan for sweeping new regulations. Regulations meant not only to stem the present global economic crisis but also any future ones. And for the US to decide whether to accept the EU plan, in which Gordon Brown has a big part, for saving the world. Gee, why not also make April 2 the drop-dead deadline for getting a space station on the moon, finding the cure for AIDS, and ending global poverty? Of course there needs to be an international, coordinated approach to dealing with the crisis, and yes we know that Europe is being hit even harder by the economic crisis than the United States. But this 'hurry up and sign on the dotted line because the sky is falling' -- c'mon guys. If there was ever a time for a U.S. President to invoke the raw power of America's hyperpower status, the G20 summit is it. This should be a working summit, a discussion summit, and not the place to agree to regulations that will have a profound affect on the entire world for many decades to come. President Obama outlined broad plans on Wednesday to revamp the nation’s financial system. Obama is seeking a host of new regulations amid a historic meltdown to prevent a future financial crisis. Obama has said he would like to complete an outline on future regulation by a G-20 heads-of-state meeting in London in early April. Moving legislation through Congress, however, could take more time. House Financial Services Committee Chairman Barney Frank (D-Mass.) has laid out a two-stage process for regulatory legislation that will be a lobbying bonanza, with outside think tanks, advocacy groups, government panels and watchdog offices weighing in with stacks of reports. The definition of "low-information American" is "Democrat politician." So I'll cut President Obama slack and assume he really doesn't know that if only we'd had an unforgiving and chaotic capitalism, the global economic crisis would have been over by now. There has been so much government intervention in financial markets here and abroad that it'll be a miracle if the world pulls out of the worst part of the economic crisis by the start of the next decade. There is no solution for this problem until everyone throws in the towel and finally admits that Ayn Rand was completely right; that will happen only with a profound transformation in consciousness that might be slated for the year 3,001 CE. Until then, we'll have to bump along with governments playing mechanic whenever their regulations produce economic chaos. Of course this always results in more government regulations. But we're trying for least harm here. And that means the United States shouldn't rush to do things the EU way. The 20th member is the European Union, which is represented by the rotating Council presidency and the European Central Bank. So that's why they don't describe the G20 members as "nations;" it's because the European Union is a bloc of nations. Looking at our map of the world we see that Italy, France, Germany and the United Kingdom are in Europe and the EU. That means the EU Big Three are twice represented at the G20 summit, which gives them tremendous clout. If you say, 'Hey, no fair' -- there is no 'fair' from the EU point of view when it comes to wringing concessions from a hyperpower. That's their excuse and they're sticking to it: the USA is a hyperpower and so we need to eke out a little patch of bipolarity in the world. The EU viewpoint studiously overlooks the fact that the big bad hyperpower has made it possible for Western Europe to recover from two world wars in relative peace and raise a very powerful trading bloc that is America's biggest trade competitor. I think even before he was in office President Nicolas Sarkozy proposed that the EU nations take on responsibility for defending themselves. The proposal went over in Europe's major capitals (including Paris) like bacon at a bar mitzvah. Why spend money on defense when those governments can rely on the USA for defending them, which frees up the European governments to support massive social welfare programs? So I don't want Democrats writing me to complain that not all their politicians are low on information. Virtually every Democrat politician points to Western Europe's social welfare programs as a model for the United States. Earth calling Democrats: You want the European Social Welfare model applied to the USA? In that event, who's going to take on the responsibility for defending the US -- not to mention Europe and the Middle Eastern oilfields -- if the US follows the European welfare model? China? Guatemala? Or should we ask the EU and their flotilla of rubber duckies to patrol the oceans? Where was I? The Hill's report on the Obama administration's scurrying to concoct new regulations is a handy guide to the kind of regulations being considered. With regard to the EU plan, a UK Guardian report from February 16 sketches the broad outline of Gordon Brown's plan for saving the world from economic catastrophe, present and future. I suggest you use the report, which I have posted below, as a handy program guide for Brown's speech to the U.S. Congress on March 4. Is it a good idea to give more funds and power to the IMF? There's no choice about adding to their coffers. They're having to bail out a number of European nations and before the global downturn is over they'll probably have to bail out half of Africa. With regard to increasing the IMF's power: I would rather see the IMF take the heat than the USA for the mistakes and friendly fire that are to occur in the fog of war against the global financial crisis. So while I want to see all the details before saying yes, I am in favor of handing the IMF some I repeat some regulatory powers. As for the rest of Mr Brown's proposals: he's trying for more integration and control of the globalized financial markets so to prevent another falling-dominoes scenario. This, on the argument that all the markets are inextricably entwined. But you can argue, as Phillip Blond has (see my post of yesterday), that it was the lack of firewalls to protect domestic financial markets that turned the housing mortgage crisis into a global series of cascading catastrophes. How to set up firewalls for markets that trade both globally and locally? That question should be the top one for Obama's regulatory team, the Federal Reserve, and Congress. The answers they come up with should be America's top contribution to the G20 summit. As for Gordon Brown's plan to give the G20 a permanent secretariat -- you gotta think like a bunko squad cop to fathom Mr Brown's machinations. Gordon Brown is making reform of the International Monetary Fund, its governance, funding and powers of surveillance, the centrepiece of a 45-day diplomatic drive in an attempt to make the G20 summit in London a turning point in remaking the international economic order. Brown, in alliance with the Australian prime minister Kevin Rudd, wants to increase the funding of the IMF, speed up a review to give China and India clearer voting rights, and also give the fund powers to direct nation states to respond to its surveillance reports. He also wants to give the G20 a permanent secretariat, so making it a powerful body overseeing finance and largely eclipsing the G8. The prime minister is meeting the IMF managing director, Dominique Strauss-Kahn, on Wednesday, the pope on Thursday and the Italian prime minister, Silvio Berlusconi, on Friday, before joining a mini-summit of European G20 members France, Italy and Germany in Berlin hosted by Angela Merkel, the German chancellor. No 10 angrily denied suggestions that Merkel is lining Brown up to be a new IMF super-regulator. Some officials believe a cabinet member leaked the suggestion. Britain is chairing the G20, with a summit in London on 2 April to be attended by Barack Obama, and Brown is using the event to advance his long-nurtured plans to reform the IMF. It is a huge test of his diplomatic skills as he seeks to weld conflicting goals and ensure practical proposals emerge rather than rhetorical bombast that fails to assure the markets. On the IMF, Britain wants to expand its existing lines of credit, so giving "emerging market economies" an opportunity to contribute. Brown has also considered a loan or bond facility funded by Arab states, Japan and China. He and Rudd also want allocate additional special drawing rights (SDRs) to the IMF's newer members, as agreed in 1997, so giving them access to foreign exchange. SDRs are an official international reserve asset issued by the IMF to its members, who can exchange them for freely useable currency. Strauss-Kahn has called for the IMF's resources to be doubled $500bn. Brown is also interested in the IMF supporting – through expertise and financing – the creation of a network of national "bad banks" to take on toxic assets. Finally, he wants to give the IMF a strengthened mandate to provide early warning of weaknesses and advice on remedial policies, similar to those provided by a central bank. At a seminar on the G20 summit last week Brown argued: "The world lacks a proper early warning system. There is the Bank for International Settlement, there is the Financial Stability Forum, but we have never given anybody sufficient teeth so that their views are treated so seriously that people will immediately have to act when that early warning is given. We still lack the means for financial supervision." The International Monetary Fund, he said, "cannot have a role that is simply commentating on the global economy, it must have a surveillance role that is effective". He added: "If people feel that the IMF is simply the representative of the richest countries with very little say for the poorer countries, if people think that the World Bank is similarly constructed, then people are going to either seek to have other institutions or going to reject the existing institutions, and of course the danger of that at this time is protectionism." The aim appears to be develop a "grand bargain" in which there is a greater role for emerging economies such as China in the IMF, and easier access to its financial assistance, in exchange for such countries playing by the global rules and not trying to build up surpluses and reserves as an insurance policy. Other issues to be addressed include whether hedge funds and shadow banking are brought within the remit of regulation and Brown has also asked Pascal Lamy, the head of the World Trade Organisation, to compile a report for the G20 on the threat posed by protectionism. Brown now reckons that unless new credit lines are opened, as many as 100 million people will be driven into poverty as a result of the global financial crisis. He has been struck by figures from the International Institute of Finance which said two years ago net flows to the emerging markets were nearly $1 trillion, but that in 2009 this figure will be $160-170bn – a 700% fall in two years. "The question is: will the U.S., the biggest financial player in the world, ever agree to the binding international regulation the Europeans seek?" I did not watch President Obama's appearance before Congress because earlier in the day it was announced that Britain's Prime Minister Gordon Brown would be addressing Congress on March 4. This meant I had to place myself in the proper state of mind to analyze the reasons for Brown's visit, which I did by watching a Dirty Harry movie -- Magnum Force, to be exact -- that aired on cable at the same time as Obama's speech. The scheduling conflict was unfortunate but of the two addresses to Congress, Brown's speech will be far more important. However, I did read the prepared text of Obama's speech and William Kristol's Washington Post analysis of it. You’d never know from the one-sentence discussion of Afghanistan that just last week the president had ordered an additional 17,000 troops there. Obama doesn’t seem to think his responsibility as commander in chief is in any way special. He certainly felt no responsibility even to begin to educate the public about this theater to which he’s committing additional American soldiers. Instead, both the wars in Iraq and Afghanistan were treated as sideshows to “a new era of engagement” that Obama claims has begun. This was not the speech of a man who thinks of himself as a war president. Now, now; we must take our cue from Britain's Labor government and not fling around inflammatory terms. The U.S. is not at war; we're engaged in peacekeeping endeavors. With regard to Iran, here we must take our cue from Secretary of State Hillary Clinton. Last week she argued, in essence, that neither she nor anyone else had ever actually seen North Korea's nuclear enrichment program; ergo, there's no way to tell whether any such program exists or ever existed. Now do you see how simple life becomes when you don't have to go blind poring over intelligence reports and endlessly weighing their conclusions? So there's the answer to Kristol's complaint: have you ever actually seen the Iranian nuclear enrichment program? What about Iranian nukes? Do you know anyone who has seen an Iranian nuclear weapon? Then why bother to bring up the subject during a presidential address to Congress? I know how unpopular it is to be seen as helping banks right now, especially when everyone is suffering in part from their bad decisions. I promise you — I get it. [...] In Congressional testimony this autumn, former Federal Reserve chairman Alan Greenspan notoriously admitted that his free-market philosophy was inadequate. Yet nothing that occurred under Greenspan's tenure had to do with freedom. Banks that enjoyed a monopoly due to their federal charters were permitted to transfer assets away from their balance sheets to other entities, allowing them to use much less capital to support assets than in the past. Even worse, the Federal Reserve allowed larger and more sophisticated banks to put less capital against assets that bore a high rating from Moody's and Standard & Poor's -- the agencies that later owned up to having sold their souls to the devil for revenues. Greenspan, it turns out, presided over a bubble manufactured by the most-regulated private companies in the world, the large commercial banks, who operate with the implicit guarantee of the US Treasury. When the banks got into a hole, the Treasury guarantee became explicit, and floated the banks out of the hole with several trillions of dollars of actual and prospective taxpayer money. [T]he great housing crash is primarily the result of the absorption of all local, regional and national systems of credit into one form of global credit. The world's financial system lacked the firewalls needed to separate local from national and international capital. Unduly reliant on one source of credit supply, the residential asset market collapsed when this supply was compromised. The housing bubble was just the last and most notable piece of neoliberal speculation to burst. Or rather I would disagree if any two people could agree on a definition of the term "neoliberal." But in the context of his argument clearly Blond thinks of neoliberalism as supporting 'free' financial markets. As Spengler pounded home, it's a myth that the markets are free. Without knowing exactly what he "gets," how to sum President Obama's speech -- or rather the prepared text, which is stripped of the drama of Obama's address? The text was short on details regarding plans for the banking sector; as such it can be read as more dithering, of the kind that Treasury and Federal Reserve have excelled at during the past month. Aside from that I think the speech was constructed to mean different things to different people. As for me, I see the speech as a warm-up act for Gordon Brown's address to Congress. So I wait and watch, in the manner of a cop on a stakeout. Mr Brown and Britain's Labor Party are fighting for their political life. I'd say that Labor is bent on extracting as much help as possible from Washington in exchange for -- what? That's what I'm trying to figure out. One thing is certain: Mr Brown has not earned the honor of speaking before both sitting houses of Congress. And at this point there is no discernable reason why the U.S. government provided him that venue. What is widely known is that Brown and other EU leaders are pitching a coordinated financial recovery plan that will be formally introduced at the Group of 20 Major Economies meeting in April. The plan, as reported by TIME magazine, calls for the introduction of sweeping international regulations, which a professor at the London School of Economics cuttingly observed will upset America's "Joe the Plumber types." All that explains nothing about Brown's appearance before Congress -- although it might explain why dithering has become the byword for the Obama administration's approach to the banking crisis. It could be they've just been marking time, waiting to learn how Europe plans to handle the crisis. One thing is clear: the American people will learn soon enough what Gordon Brown and his political party want from our "special relationship" with the British. And if my hunch is right, Brown's address to the Congress will put President Obama's speech last night in a clearer context. When I was seven I was approached on a school playground by a classmate who'd not spoken to me before. He announced without preamble, "It's all going to die." When I asked what he meant he swept his hand to take in the playground, the trees and sky, and replied, "Everything. It's all going to be killed, everything that's alive. There's a weapon; it's called an A-Bomb. It's going to kill the world." I snapped, "Who told you the world was going to die?" The boy replied, "My father." "How does he know this?" "He's an engineer. He knows these things." I studied the boy's solemn face, the grave look in his eyes. The passage of time has not dimmed my memory of the anger that came over me. That a grownup would place the weight of the world on a child struck me as horribly cruel. I was new to the school. "What is your name?" I drew myself up to my full height and with all the certainty I could muster I said, "Bill, I am telling you that the world will not die." He turned over my words in silence. Finally he asked, "How can you be sure?" Thinking fast I replied, "Because my father is a scientist and scientists know more than engineers and my father says the world is not going to die." I was winging it; I figured that if the world was going to die I would have overheard the news. Some of my earliest childhood memories are of creeping back down the stairs after I'd been put to bed, then hiding behind an armchair to listen to the debates among the stream of scientists and mathematicians who visited with my father. Bill did not seem persuaded by my assurances but from his frown of concentration as he walked away, he was at least thinking about what I'd said. That was not enough for me. When my father arrived home that night I flung at him, "Is it true?" Then I blurted the story. The atom bomb caused great destruction but it was unlikely that it would kill all living things, my father told me. "Then you must explain this to Bill's father," I pleaded. "And he must explain to Bill." I gave my parents no peace until they agreed to speak with the school principal about the situation. There followed a meeting between my father and Bill's, who'd had no idea that his son was expecting the world to die at any minute. A few days later Bill hailed me on the playground. The sorrow had left his face. He related that his father had told him that what my father said about the bomb was true. "I'm going to be a scientist or engineer when I grow up. I want to stop all the bombs," he added with confidence. I cannot recall that we ever spoke again and I did not return to the school the next year. Yet the childhood encounter returns to mind sometimes when I contemplate situations that threaten to doom the human race. I thought of Bill on Sunday when I checked Google News. At first I thought I'd misunderstood the headline: Team finds secret that could stem flu viruses. So I took a moment to gird myself against unwarranted exuberance before reading the article. I had not misunderstood. The research results give hope that scientists have beaten the influenza virus at its own game. The game includes H5N1 and any of its possible recombinations. We're not out of the woods yet. The most feared recombination could be drawing nearer with the recent outbreak of Ebola-Reston virus in pigs in the Philippines. Ominously the pig form of the virus has already been transmitted to humans, although the few who are known to have contracted the virus did not die from it. How the Ebola virus jumped from monkeys to pigs is still unknown. But if the Ebola pig virus should recombine with H5N1 to produce a highly infectious deadly influenza for which humans have no antibodies, the consequences are almost unbearable to think about. If the research pans out it could be years before a super-vaccine is ready -- a vaccine you take once in your life, and which is good against influenza in any form. Yet we now have a fighting chance to ward off a global killer pandemic that would be devastating to modern societies. I hope Bill has lived to hear the news. Humanity will not go the way of the dinosaurs. We will not fail. Who dares say this? The daughter of a scientist. Crossposted at RBO with accompanying artwork. That's the spirit. We'll be ready for them when they show. Crossposted at Uppity Woman with a great introduction that invokes the era in America when schoolchildren routinely dived under their desk when the air raid siren went off. For anyone looking for reminiscences about life in Cold War USA, Uppity's comments (and those of a number of her reader's in the comment section) are the bomb, if you'll pardon the expression. 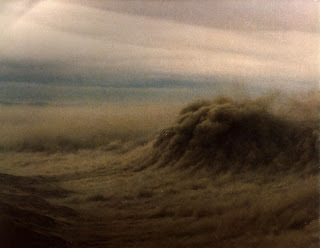 There's been so much interest in this old post I'll mention that starting in the spring of 2014 I began a series titled "Water Crises Gordian Knot." After a hiatus of several months from water topics I returned to the fray in 2015 with so many posts on California's water shortages and shortages around the world that I've lost count. In these I've focused on illustrating the incredible scope and complexity of problems connected with the shortages, whether it's water toxicity, land subsidence, flooding, and so on -- and their sameness across the USA and around the world. Talk about everyone being in the same leaky boat! Here are my four latest water posts; all but the last are specific to California -- but again, all can apply to water problems across the USA and the world. Kindly note the exchange in the comments section and the link I provide there to a New York Times article on California's drought. I'll be putting up a post that expands on the comments but for now: California's bout of plentiful rain does not mean the end to the drought there. "[If] there's a third dry year, permanent crops such as orchards and vines are going to either be removed completely or kept barely alive..."
The situation for California, as it enters its third year consecutive year of drought, is grim, and with the additional burden of the financial crisis, nearing the brink of catastrophe. In the 2005 post Another Kind of Darkness, I discussed the water wars that took place in 1900's California between the fledgling City of Los Angeles and the farmers of Owens Valley. The city won, and the megacity of Los Angeles was the result, but not without the cost of desertification in the valley. It's a story that has been repeated countless times around the globe during the past century. But one would think that California's modern-day government had absorbed lessons from Owens Valley. It didn't. After decades of California's inadequate water policies and studiously short-sighted hydropolitics (the politics of water and water resources) the only hope left this year is ample rain and snow. If the miracle doesn't materialize in a year expected to be dry, there's just simply not enough water to meet projected demands. Will they ever learn? Let me put it this way. The drought could turn out to be for California what Hurricane Katrina was for the City of New Orleans. Decade after decade thousands of people resided below sea level in that city, all the while knowing that it was certain death to stay there if a strong hurricane hit. Decade after decade, Californians have surveyed their parched lawns during a drought and said, We really need to solve the water problem because one day there's gonna be a really bad drought. The answer is of course they won't learn until they're forced to by a dust bowl covering much of the state. That's human nature; deal with it because you have no choice. But here's a tip for Nancy Pelosi and the rest of the U.S. politicians who lecture about saving the planet from global warming: if you want to save the planet, why not try something new for a change? Start small and work up to the big stuff. Learning to walk: practice. Learning to talk: practice. Saving the world: practice. But practice on your own neck of the woods before you inflict your half-baked ideas on the rest. I do not want to hear that California's water crisis is the result of global warming. It's the result of human nature compounded by stupidity. And three guesses who'll have to pick up the tab for rescuing Californians from that much stupidity. Before we get to the nitty gritty of this post, let's contemplate a few bits of data first. Water, like air, is a necessity of human life. It is also, according to Fortune magazine, 'One of the world's great business opportunities. It promises to be to the 21st century what oil was to the 20th.' --CBC (Canada). 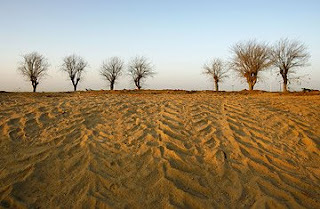 There are those in Iran who must abandon their homes due to lack of water; they are known commonly as 'water refugees'. In Gaza, less than 15 gallons of water a day are available to each Palestinian (opposed to each American who has 800 gallons of water available a day). If you think things couldn't get worse in the Middle East, look to the foreseeable future, when usable water will be far more precious than oil.--Susan Williams, Indiana University, October 12, 2002. By 2015 nearly half the world's population—more than 3 billion people—will live in countries that are 'water-stressed'—have less than 1,700 cubic meters of water per capita per year—mostly in Africa, the Middle East, South Asia, and northern China. --"Global Trends 2015," CIA Report (2000). Global water consumption has risen almost tenfold since 1900, and many parts of the world are now reaching the limits of their supply. World population is expected to increase by 45% in the next thirty years, whilst freshwater runoff is expected to increase by 10%. UNESCO has predicted that by 2020 water shortage will be a serious worldwide problem. One third of the world's population are already facing problems due to both water shortage and poor drinking water quality. Effects include massive outbreaks of disease, malnourishment and crop failure. Furthermore, excessive use of water has seen the degradation of the environment costing the world billions of dollars.--SaveWater.com. This is not a very pretty picture. Fortune magazine got it right. Keep in mind. Inhabitants on our big blue marble could manage to survive without oil and natural gas but nothing will survive without water, which is a diminishing natural resource. This takes us to the reason for this post, an article published December 17, 2008, in The Bakersfield Californian. Staff writer Courtenay Edelhart reported on a U.S. Fish and Wildlife Service decision regarding water districts that "rely on the San Joaquin-Sacramento Delta (left) for much of their water supply" and that "could potentially hike water rates for consumers and hurt farmers already smarting from a drought." In 2007, a federal judge ruled state and federal pumps sending some 6 million acre-feet of delta water south to Kern County and other users each year could wipe out the endangered smelt, a tiny silver fish. The court ruled pumping had to be curtailed by about a third until the U.S. Fish and Wildlife Service could weigh in on the problem. On Monday, the federal agency submitted a 400-page "biological opinion" to the U.S. Bureau of Reclamation on the effects of pumping by the Federal Central Valley Project and the California State Water Project. The agency concluded pumping was "likely to jeopardize the continued existence of the delta smelt (right) and adversely modify its critical habitat," and offered a plan to mitigate damage. The plan would keep current restrictions in place, and even more limits could kick in under certain conditions. Further cuts would be triggered in a variety of scenarios, including limited rainfall during key periods in the fish's spawning cycle. Robber's Roost, Kern Co., Calif.
Jim Beck, general manager of the Kern County Water Agency, which contracts for water on behalf of agricultural, municipal and industrial water districts in Kern, said "Implementing the plan would reduce water supplies from San Diego to San Jose by 20 to 30 percent on average, but up to 50 percent in some years." As always, this is not the end of the story. Other water districts, which "have long argued that pumping isn't the real culprit in the smelt's demise," are "gearing up for a fight." Invasive species, pollution and greater municipal and industrial uses of delta water are important factors that have not been given enough attention, said Robert Kunde, assistant engineer manager for the Wheeler Ridge-Maricopa Water Storage District. "There are a number of good reasons to believe that even if State Water Project pumps were cut entirely, the delta smelt may very well go extinct," Kunde said. Al Donner, assistant field supervisor for the Sacramento field office of the Fish and Wildlife Service, said all that has been looked at, but pumping cannot be discounted. "The indices that track the smelt show the last couple of years, they've been at their lowest numbers ever," he said. "The species clearly is in trouble." Back in June 2008, the Bakersfield paper reported on the second year of drought problems for farmers who once grew such products as cotton, pistachios, almonds and alfalfa. Faced with too little rain and restricted pumping to protect an endangered fish, farmers and ranchers in and around Kern County are facing tough choices. In a typical year, 850,000 acres are irrigated, according to the Kern County Water Agency. This year, about 45,000 of them will be idle at a cost of $46 million. In addition, 100,000 acres will be "underirrigated," causing a $59 million loss. Also in June 2008, the Bakersfield paper reported that the U.S. Bureau of Reclamation was "further shrinking the amount of water allocated to farmers subject to the Central Valley Project contract, which regulates water use on many farms in the Kern County area." "It's not a pretty year," said Fred Starrh of Starrh and Starrh Farms, ... "There's just not a lot of water around. It's almost like gasoline for us. The price of water has almost tripled." In October 2008, the Bakersfield paper reported on "plans to cut water allocations to cities and farms to the second lowest level since it began making deliveries in 1962, which local growers said could push farmland out of production and boost already soaring grocery prices higher." The California Department of Water Resources says that after two consecutive dry years and court-ordered restrictions on pumping from the environmentally sensitive Sacramento-San Joaquin Delta, the State Water Project will deliver just 15 percent of the water that water agencies across the state have requested for next year. Without court-ordered restrictions to protect the threatened Delta smelt from pumping, the state's water allocation would have been 20 percent, 5 percent more than what's been predicted. Kern County Water Agency general manager Jim Beck said between the smelt and explosive Central Valley population growth, there is far more demand for water today than during the last major drought of 1988 to 1992. Now, you ask, what makes this a "water war"? Would it interest you to know that as recently as October 2005 "agriculture" had finally "won" a 50-year water war in this same part of California -- with the Bush administration "driving the trend?" In the western San Joaquin Valley, a desert is blooming with cotton and produce, all sustained with water from California's northern rivers. But in the places where this water once flowed -- the delta of the Sacramento and San Joaquin rivers, the Trinity River in the far north state -- fisheries have declined drastically. That's a direct result, biologists say, of water diversions to the south. 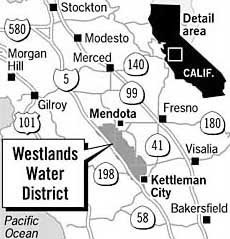 First among the winners of the water wars is the Westlands Water District (right, 2001) southeast of Fresno -- the nation's largest irrigation district. 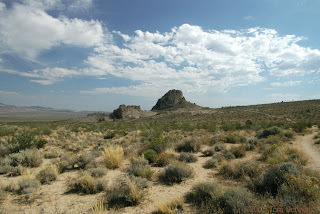 Pancake flat, this 600,000 acres of arid alkali dirt is one of California's most desolate regions. Yet Westlands is growing riotously: not in homes or shopping malls, but in melons, tomatoes, almonds, cotton and myriad other crops. Its fields produced about $1 billion in food and fiber last year. Westlands gets its water from the federal Central Valley Project, which supplies water to a third of California's cropland and about 50 cities, including Sacramento, San Jose and several in the East Bay and on the Peninsula. The district's annual allotment of about 1.15 million acre feet -- enough to supply about 2.3 million families -- dwarfs those of all other project participants. The next biggest, the Contra Costa Water District's, is only 185,000 acre feet. An acre foot is the amount of water that covers an acre a foot deep. Now, Westlands and other districts are successfully renewing their long-term contracts at current levels and at prices far below those paid by the state's growing cities, despite protests that pumping large volumes of water south is killing Northern California's fisheries. Westlands is singled out for particular criticism because of its size and the amount of water it receives, but also because the irrigation of its fields produces toxic drain water, threatening state waterways. Some critics say much of its acreage should be taken out of production. So far, about 200 contracts have been approved, and 80 more are pending, including Westlands'. About 6 million acre feet of annual water deliveries is at stake. Farmers who get federal water are generally charged a fraction of the free-market rate. Then along comes a two-year drought and the tiny silvery endangered delta smelt that sends up a red flag about the whole thing. On July 10, 2008, the U.S. Fish and Wildlife Service changed the status of the "critically imperiled delta smelt (Hypomesus transpacificus) from threatened to endangered" under the federal Endangered Species Act. However, the Bay Institute, Center for Biological Diversity, and Natural Resources Defense Council had "petitioned the Service in 2006 requesting a change in the federal listing. The finding is 25 months late, and a final listing determination is already 13 months overdue." "We are seeing a cascading series of crashing Delta fish populations – delta smelt, longfin smelt, chinook salmon, steelhead trout, green sturgeon, Sacramento splittail, striped bass – the warning bells are ringing loud and clear," said Jeff Miller with the Center for Biological Diversity. "The ecological collapse of the Delta threatens more than just our native fish since millions of people depend on the Delta for drinking water, agriculture, and fishing." Delta smelt are an indicator of the health of the San Francisco Bay-Delta ecosystem, and the smelt population has plummeted since 1993 when it was listed as threatened. Smelt abundance this summer is the fourth lowest on record since surveys began in 1959. Federal and state agencies have allowed record levels of water diversions from the Delta in recent years, leaving insufficient fresh water to sustain native fish and the Delta ecosystem. "The governor's proposal to build more dams, as well as regulatory efforts to continue to allow record freshwater diversions from the Delta when most of our native fish species are struggling to survive, makes no sense," said Miller. "The state and federal water projects need to change their operations to eliminate reverse flows in Delta channels and prevent further losses of fish at the pumps." So, this is the end of the story, right? Nope. Time for a lawsuit. ...against the California Fish & Game Commission and the California Department of Fish & Game challenging the Commission's recent decision to potentially impose substantial cuts in State Water Project (SWP) water deliveries to much of the San Francisco Bay Area, the San Joaquin Valley and Southern California in an effort to protect the longfin smelt. The lawsuit asserts that the Commission's November 14, 2008 decision opens the door for dramatic new restrictions on SWP and Central Valley Project (CVP) water pumping operations out of the Sacramento-San Joaquin Delta (Delta) without any significant corresponding benefit to the fish species and, in so doing, violates key elements of the California Endangered Species Act. Last month, the Commission approved these regulations as a precautionary measure in its desire to protect the longfin smelt, a fish species found in estuaries from Monterey Bay to Alaska. Bottom line? In addition to current drought conditions, decrepit infrastructure, invasive species, and the water quality itself at risk, that is? Reduced water deliveries and negative "economic impact" to the SWP and U.S.-operated CVP. M-O-N-E-Y. This is only one little piece of a country - and worldwide iceberg but a good illustration of what lies ahead. There is a new administration in Washington, with many departments and policies yet to be determined. The reign of the Governator is in peril. So much can change in a very short time -- much like the weather. As the Bakersfield newspaper articles indicate, there has been a 50-year plus battle in this one part of our country, one which is a major source of our food supply. Stay tuned. This is one of the most important issues facing us. There'll be more to come. U.S. Localism: the solution to Hyperpowerism and Globalism Run Amok? Dan Riehl at Riehl World View argues that American Localism can emerge from a return to an anti-Federalist ideology. That won't be so easy given that the Left and Right in today's America have taken Federalist policy far beyond what the early American Federalists envisioned. Britisher Phillip Blond's version of Localism seeks to work within the framework of his country's Conservative party. I'm not so sure the same can be tried with America's Republican party. Americans have been dodging the fact that both our major political parties no longer have a middle or strongly opposing viewpoint: the GOP party is simply the Conservative party, and the Democrats are simply the party of the Left. Yet both the Left and Right in America have converged in the most destructive ways. Both have abandoned American foreign policy in favor of what can only be called hyperpowerism -- the belief that as a hyperpower the United States government can't have a truly American foreign policy and instead must act from a position that is an awfully queer mixture of globalism and imperialism. And both parties have embraced a form of federally backed economic globalism that subverts the free market to what Blond neatly sums as "a model in which competition is reduced to a cartel of vast corporations maximising profits by discouraging competitors and minimising wages by joining with the liberal left to encourage mass immigration." Keep in mind, this isn't the localism we'll soon be fighting in the free speech debate we're discussing. It has nothing to do with that. The Left has nothing to offer an America as we envision it. They are the party of a repeatedly failed collectivism. But the corporate-Republican embracing of Globalism carries with it threats to America, as well. The extreme of a potential new conservatism for the Right can be seen now in the survivalist mentality. And that's no solution at all. Hopefully somewhere in the middle is a ground that both accounts for the driving need for globalism, but does better on quality of life issues the Right has ignored for too long. Really there needs be no new great invention of a politics for America -- it can simply be a turning back to anti-Federalist views, which appreciate the need for more power to reside within the States. At the State level, power should be left within cities and towns as much as possible. I believe one can accommodate the political aspirations of [Phillip] Blond into America's existing framework. So it's more radical in contemporary thought than traditional practice given our History. The question is, how do we turn the power flow up to the Federal Government around? This entry is crossposted at RBO with her usual great taste in illustrations. Love to know where she found that pix of the "globalist" American flag. Yesterday Dan Riehl wrote a review of my Red Tories post for his Riehl World View blog. I liked his observations so much that I published them as an introduction to the post. I think that unless some version of Phillip Blond's Red Tories manifesto is adopted in the USA the gulf between Washington and the rest of the country is only going to widen -- so much so that we could be looking at the breakup of the union. Yet the political platforms of the Democrats and Republicans are designed more to tear down the opposing party than find fresh approaches to today's issues. And both parties are clinging to tenets that in many cases no longer have relevance in the present context of affairs; because of this they've backed themselves into contradictory arguments. The other night CNBC aired a speech by the late economist Milton Friedman; during the Q&A he observed that whatever criticism one might have of globalization people had to remember that it had lifted hundreds of millions of people around the globe out of abject poverty. I interject that when I mentioned his comments in my post of yesterday I wrote that CNBC aired a speech that Mr Friedman had given the other night. I have corrected the error (Milton Friedman died in 2006), but dead or alive he doesn't get off the hook. His claim about the benefits of globalization was a sweeping statement but if we accept it at face value, what would Mr Friedman say when confronted with an American worker who must compete with the entire world by sitting in commuter traffic four hours a day and working two jobs -- just so he can afford enough in interest payments to make it to the next payday, and who has no hope of climbing out of crushing debt? Capitalism, which supports globalized trade, is rooted in the profit motive. Would Mr Friedman ask the worker to abandon the linchpin of capitalism so that the rest of the world could climb out of poverty? If so, in effect Mr Friedman would be demanding that the worker act in the manner of a monastic who renounces worldly desires -- a monastic who must also keep up his income tax payments. There are sound defenses for certain aspects of globalization. But to base a defense on the premise that the American worker must be enough of a capitalist to work by rules that stack against him in the global marketplace, and enough of an altruist to sacrifice his best interests to the global good, is to talk gibberish. Yet it is just such gibberish that Republican invoke in their arguments for keeping Americans working for diminishing returns in order to support globalization measures that do not serve their best interests. As for the Democrats -- when it comes to the point where "progressivism" means a rehash of Saul Alinsky's ideas and "change" means the Chicago Way of getting things done, you know it's the end of the road. Phillip Blond's manifesto avoids the blind alleys into which Republicans and Democrats have wandered. When you strip it down he's simply calling for a return to common sense. This entry is cross-posted at RBO (with a fabulous Wake Up America poster) and Uppity Woman, and linked at Riehl World View with some very interesting comments by Dan Riehl on Blond's localism -- and how America can readily adapt his ideas. The Juggernaut of Multiculturalism comes up against the Juggernaut of Protectionism. Why does this remind me of a scene in Jurassic Park? A year ago I wrote a post that I sarcastically titled More on Archbishop of Canterbury's voter registration drive for the British National Party, in which I warned that the archbishop had gone too far in his determination to shut up Britons and ram Sharia law down their throats. That followed my Rise of Mordor posts on the archbishop's call for the instatement of Sharia law in Britain, and his frightening call to criminalize unkind and thoughtless speech. (1,2) While Britons fumed over his remarks, Williams ducked the issue by parsing in virtually unintelligible sentences exactly what he had said and not said. A year or so before, many of those Britons wouldn't have been caught dead belonging to the BNP. But with the widespread perception that British society was crumbling while Labor fiddled, desperation had driven many Britons to the BNP -- with the inevitable result that the BNP platform had to become somewhat more inclusive to accommodate all the new members. As late as the Spring of 2008 the Labor government had a chance to save the situation by making real changes. But Gordon Brown and his advisors settled for trying to 'manage' the outpourings of anger. Of course the government didn't have a crystal ball; they couldn't imagine the meltdown in the banking industry and the credit markets and how, within a matter of weeks, the financial crisis would engulf the United Kingdom and ignite the most virulent protectionist sentiments. But that's always the way it is. It's never just one thing; it's a buildup of several things, until a government is sitting on a mountain of bone-dry tinder. Then, all it takes is the spark of one incident. The spark turned out to fury about loss of jobs to foreigners and immigrants, as is evident from John Batchelor's post. Realize that it was never really about Islam. The growing Islamization of British society was only a symptom. It was always about Gordon Brown's push to make Britain the world's Sharia banking capital, and the government's attempt to quash both dissent against Islamization and the loudest yelling from extremist British Muslim groups. To get everyone to shut up, the government had to deploy multiculturalism laws so ruthlessly that it could be fairly said the government was veering toward totalitarianism. That is why even some British Muslims (and Sikhs and Hindus) demanded to join the BNP. They or their parents or grandparents had not fled their countries to live under a government so sweeping in its control that even the slightest politically incorrect word or action might be cause for criminal charges. [...] The report had concluded that Britain's "misplaced deference to multiculturalism" was undermining the fight against extremists, and that military and security services were having to fight threats at home and abroad. The defence minister, Bob Ainsworth, described Rusi's report as "extraordinary", and rejected its findings strongly. So it really comes down to David Cameron. If he listens to Phillip Blond, that is perhaps the Conservative party's one chance at mounting an effective answer to the British National Party. It seems Cameron is listening, at least to some extent. But the window for decisive action is closing fast. If all the above is news to Americans, ask your major news outlets why they haven't been reporting on the issues. Only those Americans who kept very close tabs on doings in Europe had any idea how much anger had built up in several EU countries about the heavy-handed use of multiculturalism laws to silence dissent. Nothing in human affairs happens out of the blue. Europe has been in big trouble for at least three years; anyone who has closely followed the Gates of Vienna blog knows that. As to what it all means for Americans -- it means the fight of our lives against the same kind of multiculturalism laws that hold several EU populations hostage. But globalization and giving the world's poorest a leg up are not the real issue; the issue is the kind of laws that were created to enforce dictates that globalized trade imposes on democratic societies -- laws that Left-leaning coalitions strongly support for reasons of their own. Yet when it comes to the point where citizens in a democracy must say and do nothing to offend the global consumer and the immigrant workers employed in globalized industries, you're looking at the death of liberty. Many Europeans have already figured this out and thus, the crisis on the Continent that the mainstream U.S. new media have studiously avoided reporting. What is the answer? The marriage between mega-corporations that do big global trade and government needs to be ended. The question is how it will end: the BNP way or Phillip Blond's way. I'd advise going for the latter. Update to Localism, Faux Localism, and "Rise of the red Tories"
The Localism post I published the other day is cross-posted at RBO. The blog's author, "Procrustes," chose some highly evocative artwork to illustrate various points I made in the post. She also found a picture of Phillip Blond to add my post at her site; after I saw what he looks like it could be that David Green was not simply being sour grapes when he complained that Blond is anti-modernity. Phillip Blond looks straight out of Middle Earth. Quite Hobbitish. Procrustes also sent me a very interesting post on Localism that Hyscience published in November 2008, and which features another essay by (the late) Jim Boulet, Jr. Boulet fills in some detail about Obama's view of Localism. Check out the book linked at the Hyscience post and the page that's highlighted in the Google Books reader. Once you start digging into the history of Localism, it seems it was co-opted, decades ago, by the Authoritarian Leftist Saul Alinsky and his crowd from writings by Thomas Paine and Thomas Jefferson. It also seems that it's Alinsky's view of Localism that Obama favors. However, Alinsky's interpretation of Localism could be the only one that's been in the U.S. political stream in the modern era until very recently. As I noted in my first post on the topic, I think Blond and the American Localists such as Greg Stelenpohl, are breaking new ground -- at least, in the modern era. It would be very interesting to see the writings of Paine and Jefferson on the topic. Blond's Localism, as with Stelenpohl's, seems directly linked to the agrarian reform ideas of Paine and Jefferson. And Phillip Blond's Localism is grounded in economic issues, whereas it seems that Alinsky's is grounded in getting more of the power pie from the government. Authoritarians do tend to see everything through the authoritarian prism, as we learned last year at Pundita blog from Stephen Diamond's very instructive lectures on the topic. (Dr Diamond is now blogging at King Harvest). All this is much food for thought. I'll have more to say about the issue in the coming weeks, after I cram. Welcome Sea Blogger readers, and a thank you to Sea Blogger's author, Alan Sullivan, for his comments. How I wish I were on Norman Island. Sigh. With this post I'm opening up the comment section on Pundita blog. Mark Safranski, whose ZenPundit blog has been a staple at Pundita since the early days, is a contributor to the newly-published Threats in the Age of Obama, a collection of essays edited by Michael Tanji. ZenPundit has assembled quotes from a few of the essays in Tanji's book, which give an idea of the breadth of interests represented by the contributors. I haven't yet read Threats, and I'm not familiar with all the people that Tanji has gathered for his book (see the list of contributors below). But from the names I'm familiar with the book is a good overview of the security threats that Obama's administration needs to deal with. The book is also an example of the Virtual Think Tank; as such it's as much an example of cross-discipline thinking as it is a primer on this era's security threats. The opinion of academics whose conclusions most closely serve the administration's partisan leanings and defense goals come to dominate foreign policy. And because the academics are specialists, who are rarely given to investigating outside their discipline, galactic-sized chunks of reality completely escape their attention. Tanji, a former supervisory intelligence officer at the Defense Intelligence Agency, is well-aware of the limitations of the Virtual Think Tank (see his essay on the topic, which I've linked to above). But clearly he hopes its unfettered scope will prevent the worst oversights to arise from the blinkered research and analysis that academia produces. We should all hope. In this era, when a handful of people can wreak as much destruction as a million-man army, the window for saying, 'Back to the drawing board' is very narrow. Academic specialists are necessary contributors to all types of government policy, of course. The systemic problem generated by the approach is that the traditional think-tank, and the Washington institutions that rely on them, tend to limit the type of specialist whose views are considered. And because the spur of the profit motive is largely absent from government deliberations, there isn't much incentive to rigorously question a viewpoint once it becomes entrenched at the policy level. The questioning tends to be forced in the wake of a massive failure, which is the wrong time to cast around for fresh input. The beauty of the Virtual Tank is that it opens the door wide and encourages specialists from many disciplines and starkly opposing viewpoints to exchange ideas and pool data. That is especially vital in this era because there's a big difference between research and intelligence gathering and the kind of conclusions that derive from each. Both approaches are necessary. I also note that Michael Tanji has invited Mark Safranski to contribute to his Threats Watch project, which is ongoing. The site is a good place to pick up news about emerging security issues. And speaking of the Virtual Think Tank, ZenPundit has a roundup of contributions to the latest Clausewitz Roundtable. In addition to Mark Safranski the contributors to Threats in the Age of Obama are: Daniel H. Abbott, Christopher Albon, Matt Armstrong, Matthew Burton, Molly Cernicek, Christopher Corpora, Shane Deichman, Adam Elkus, Matt Devost, Bob Gourley, Art Hutchinson, Tom Karako, Carolyn Leddy, Samuel Liles, Adrian Martin, Gunnar Peterson, Cheryl Rofer, Steve Schippert, Tim Stevens, and Shlok Vaidya. Several of the contributors have a website/blog of their own, so Googling the names will call up their credentials. This entry is cross-posted at RBO with Procrustes' usual great taste in accompanying artwork. The entry is also linked to with comments at ZenPundit and tdaxp. Don't let the part essentially about the USA being the USSR just with a different economic model for decades scare you too much. It is, of course, more complex than that. Via Pundita - Not the lightest read, nor the heaviest - but quick enough. In my opinion it's the most efficient, serious disposition on how we got here, where we may be going and what obstacles we face. It may challenge your thinking on certain things. Are entrepreneurial Hippies a conservative/libertarian thinker's best friend? Is Obama the ideal corporate Republican candidate? And does any resurgence of Libertarianism and/or conservatism demand that two legs of the Republican Party part company? It's well-enough referenced to suggest it must be taken into account. And solving the puzzle of "Globalism" is our primary challenge. There's follow-on discussion here as it pertains to Alinsky's concept of "localism - something very different than that of which Pundita writes. In the February 15 Ducking götterdämmerung post I wrote, "As a short-term fix, as the means to duck trade wars that would lead to the twilight of the global financial system, the SDR could be the best shot. [...] The long term-solution is outside the power of financial wizards." Europe's welfare states are well known and understood outside Europe; the same holds true for the Energy Banana Republics in the former Soviet Union and the Middle East, which also created a form of the welfare state. What few people even in America understood until the financial crisis is that the United States had taken a back-door approach to creating a welfare state via easy credit to people who couldn't afford to buy or borrow. In other words, trade in complex financial instruments, which fueled the credit boom, became a proxy for U.S. government welfare programs. The failure of Lehman Brothers should not have touched off a conflagration in the financial markets. But no one realized just how much dead brush there was in the credit markets here and abroad. What did become quickly evident was that with faith in the credit system collapsed, American consumers couldn't continue to finance the global exporting boom with their purchases. The more that price is our only measure of competition, the bigger the economies of scale required to compete, and the higher the barriers to entry for small local competitors. Our fishmongers, butchers, and bakers are driven out -- converting a whole class of owner occupiers into low wage earners, employed by supermarkets. And, once you have a monopoly, it demands that other monopolies serve it, just as Tesco demands economies of scale from its suppliers, driving out small and medium-size farms. I'm not sure that "monopoly" is the right word but you get the picture: efficiency-driven business production demands more and more efficiency to stay competitive, which in turn demands more and more economies of scale, which again drives the need for greater efficiency to get the edge in competition. At some stage in the spiral there's little room left at the production end for humans. At that point efficiency no longer really serves its ultimate purpose. Instead, humans become the consuming end in an elaborate distribution network that demands greater and greater efficiency to be cost-effective -- and yet paradoxically becomes less and less efficient for human users. What is efficient about sitting in a car for three hours a day to commute to a job while burning gasoline you can't afford to purchase except on credit, in order to earn enough money to pay interest on debt for purchases such as frozen green beans imported from China by a supermarket, when you could buy fresh green beans from a local grower for the same price if you had the cash? But how the frozen green beans got to your supermarket, and how the gasoline got to your gas station, is the model of efficiency. It's just that your personal life is left out of the efficiency chain. Of course there are many small businesses in the United States, but many of them service consumers who can't afford to own homes or anything else unless it's financed on credit which they can't afford. So the consumers are perpetually in debt that must be somehow financed with more debt. In short the business production model, which runs on credit, came to dominate the domestic or 'personal life' model -- but the domestic model, which consumes instead of produces, can't exist on ever-deepening debt. Ergo, easy credit became a socially-acceptable form of welfare and picked up the shortfall until the merry-go-round spun so fast that everyone fell off. And that's how the efficiency chase led by twists and turns to a financial debacle affecting the entire world. End of story. Where do we go from here? Is there a new story? Sure there's a new story; the system had spun out of control several years ago -- by the 80s, by some estimates -- and several of those who got thrown off the merry-go-around earlier on didn't curl up and die. They dusted themselves off and created a new story called "Localism." I warn there are different types of Localism and that the Authoritarian Left in America has already co-opted the concept; this, in a sneaky ploy to shut up Right-wing media outlets by bringing in a version of the Fairness Doctrine, which is so blatant in its attack on free speech that the Authoritarians had to get sneaky. Wikipedia has a helpful introductory article on the topic of Localism, which is already divided into New and Old Localism. Then there's American Localism and the British New Labor Localism and the emerging British Tory Localism that Phillip Blond represents. There's also hybrid Localism, which is an attempt (not very successful so far, it seems), to devise Localism programs from the central government level. And again, there's Faux Localism, which Jim Boulet, Jr. explained wonderfully for National Review Online in 2008. Readers who are familiar with Canada's Free Speech issues will quickly pick up on how Faux Localism works because it's a play on the multi-culturalism/diversity laws, which paved the way for the infamous federal Section 13 speech-muzzling law and its provincial copycats. However, we're concerned here with the real deal. A quick introduction to the basic concept behind Localism can be found in an interview with Greg Stelenpohl, an American who founded Odwalla health juices. Odwalla started as a hippie-type natural foods product, but it tasted so good that it became a hit with the mainstream consumer. To shorten a story, Greg ended up ousted from his company's board of directors just before the company was bought by Coca-cola and Coke's highly efficient distribution network and economies of vast scale. Greg took his five percent of the profits from the sale and set out to build local business and investing networks; note that he speaks of their "efficiency." [...] He is extending the warehouse where he lives and works into a "regional slow food centre" serving the Monterey Bay area. But that is just the most visible part of his activities. "Out of a portfolio of $3 million, most of the individual investments are in the smaller $100,000 range," Stelenpohl said. He cites a herbal medicine company, a sustainable industries publishing house, a developer of software for non-profits, and an eco retreat centre. Apart from Adina, his two commitments of over $1 million are the slow living centre and Interra, a new kind of loyalty card which aims to give small local businesses the same infrastructure to offer customers loyalty incentives as major brands such as Starbucks already have. If all that sounds terribly Granola, Localism makes efficiency work for humans again. But does Localism lead invariably to anarchy? To the death of the state and federal government? Here is where all the argument about Localism comes in. [...] Conservative party advisor Phillip Blond in this month’s cover story, which unveils a new “progressive” agenda for the British right. Blond, the director of Demos’s new Progressive Conservatism project, argues for a break with free-market Thatcherism, to be replaced by a bold new “Red Toryism” that is socially conservative, sceptical of neo-liberal economics and radically localist; the most challenging new political thesis of the post-credit crunch era. Phillip Blond labels himself a 'Red Tory', proposing a popular capitalism which respects traditional values, local communities and allows the 'little man' to participate in the economy, as opposed to neoliberalism, socialism and communism. Blond considers that a true conservative should reject present-style capitalism because it has increasingly concentrated ownership to a few 'oligarchs' and created a dispossessed group at the lower level of society, thus preventing many ordinary people from maintaining their own lives and communities. Blond argues the economic gap has widened during the last 30-40 years and the development is similar to that of the 19th century. Blond is a figure in the 'radical orthodoxy' school of theology and a fervent critic of secular liberalism. He argues that liberalism is equivalent to moral relativism, and that liberal politics can therefore only be actualised through power. It's at that point that Blond loses me, and loses his most eloquent critic thus far, David Green. Green's In Defense of Liberal Democracy, also published this month in Prospect, straightens out Blond's reasoning on some points, which clears the way for Blond's excellent crash course on how Britain became a "broken society," as he terms it, and his manifesto. The caveat is that Green makes what seems some unwarranted attacks on Blond, such as calling him an enemy of modernity. From my reading of the essay, I think what Blond doesn't like is that citizens have not mustered adequate responses to the greatest downsides of the business-driven model of society. The dislocations in 'modern' societies arising from the collapse of the credit markets make that argument for him. Yet Green's criticism is on the whole good because Blond is struggling to articulate a model of modern social order that has been growing in the manner of Topsy, and doesn't yet have strong philosophical underpinnings, much less political ones. He's made a good stab at developing the theoretical framework, which leaves much room for improvement, of course, as with the development of any new philosophy. The bonus is that in the process of laying out his arguments Blond highlights contradictions that caused the American Republican party to implode. What Republicans who voted for John McCain don't seem to understand is that it's Barack Obama, not McCain, who is the best representative of their party platform, which is strongly weighted toward globalized big business. From that viewpoint Obama is a Republican dream come true: neither white nor black, too rootless in his background to be strongly associated with any particular ethnic group, sect, creed or even any country. His strongest identification is with Chicago -- a big city, the kind of urban center where many of the world's consumers now reside. He is the perfect person to represent America's globalized, export-driven society; a persona that can't offend any customer overmuch, anywhere in the world. If Republicans say that's not what they want; that they want to be more than big business and keep to America's Western roots and values, they'd better trouble themselves to study Blond's essay. Then hunker down and work out the contradictions in their platform. I will close by noting that one of the articles I read about Faux Localism mentions that President Obama has stated that he's in favor of Localism. The article did not provide a reference for the remark or elaborate on it. Given that interpretations of Localism vary, I don't know what Obama means by the term. However, from all I know about his political career, I venture that he supports the Authoritarian Left's interpretation of Localism, which I think is false, and which boils down to giving the wishes of minority populations primary importance. In other words, multiculturalism was slapped onto the concept of Localism. Of course Localism of all kinds supports diversity of thought, as does democracy, but as you'll see when you read Blond's essay, Localism does not refer to multiculturalism or ethnic diversity. To cover up this fact is, I suspect, a stealth attempt to bend Localism to authoritarian agendas. This entry is linked at Riehl World View, Sea Blogger, and Free Canuckistan! The entry is also cross-posted at RBO. The blog's author, "Procrustes," chose some highly evocative artwork to illustrate various points I made in the post. She also found a picture of Phillip Blond to add my post at her site; after I saw what he looks like it could be that David Green was not simply being catty when he complained that Blond is anti-modernity. Phillip Blond looks straight out of Middle Earth. Quite Hobbitish. Procrustes sent me a very interesting article on Localism -- another offering by the late Jim Boulet, Jr., which goes into some detail about Obama's view of Localism. Check out the book linked to at the post and the page that's highlighted in the Google Books reader. After reading the page I note that once you start digging into the history of Localism, it seems that it was co-opted, decades ago, by the Authoritarian Leftist Saul Alinsky and his crowd from writings by Thomas Paine and Thomas Jefferson. It also seems, from the Boulet article, that it's Alinsky's view of Localism that Obama favors. So this is much food for thought. I'll have more to say about the issue in the coming weeks, after I cram. For now I venture that Blond's Localism is firmly grounded in economic issues, whereas it seems that Alinsky's is grounded in getting more of the power pie from the government. The financial crisis: Is Europe tanking? Durban 2: Should the U.S. boycott or attend?